Easy Payday Loans (UK) - Instant Decision - 97% Approal rate. Easy Payday Loans With An Instant Decision. Are you looking for a quick solution to give yourself some extra money? There are a lot of lenders out there, and you can spend a lot of your time searching through them, but Swift Money® are here to save you that time and hassle. We help search for and arrange easy payday loans. 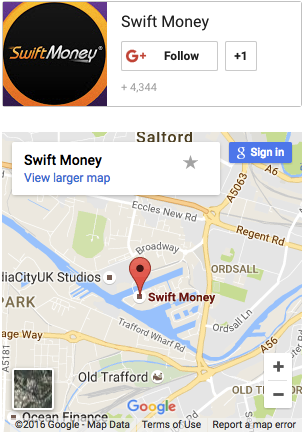 With one application through Swift Money, we can use our network of UK lenders to get you a loan with the best rates. It’s a convenient way to get the cash you need from the comfort of your own home. Allow Swift Money to help you get through a difficult financial time by applying for a loan today. Who Needs Easy Payday Loans? Unlike many banks, we don’t ask you to prove what the loan is for, and how you’re going to be spending it. If time isn’t on your side and you need cash in a hurry, we’ve designed our processing to be fast which means that you can get the help you need quickly for those more urgent situations. Swift Money® act as a loan broker. That means that we have a large network of UK loan providers that we rely on and that you can benefit from. We ask you to fill out one online application form with us that we use to find you the best easy payday loans with our lenders. This can be for any amount between £50 and £1000. Our customers return because of our fast processing times and high acceptance rate so when you really need some financial help at short notice, Swift Money® can help. We pride ourselves on our simple, easy and transparent processes from start to finish. Below you can see the steps behind Swift Money® and how we work from the moment you apply for an easy payday loan to when you receive your money in your bank account. Our application form is simple, quick and easy to fill out. We won’t ask you for any information that may be hard to get hold of. Go to "Apply Now" to complete our application form. When you have submitted your application, we will send it to our network of UK lenders to find you a loan with the best rate.You will receive an email confirming whether your application for an easy payday loan was successful. If it was, that email will direct you straight to that lender’s website to finalise the process. Please note, some of our lenders may ask you to complete their own application form before making a decision. Ultimately, the final decision is always up to the individual lender and not Swift Money as a broker. If your application is approved by a lender, you should receive an email with your loan agreement. It’s important that you take the time to read the details of the agreement and make sure your details are correct. If you are happy and wish to go ahead with the loan, you simply need to electronically sign the application to finalise the agreement. Once your loan has been approved and signed, the lender provider will process the deposit the money into your nominated account on the same day. The money can be in your bank account as quick as 10 minutes if you chose a ‘Faster Payment Service’ (charges may apply), but it can take up to 3 working days as standard. This time is dependent on your bank. Having a poor score isn’t always a problem. When looking at applications for easy payday loans, most of our lenders will consider your credit rating in combination with your current financial status. The majority of our lenders simply assess whether you could pay the money back in the required time frame so they look at your application along with your credit score. Swift Money® uses a large network of UK lenders to make it easier for you to get your short term loan. There’s no need to search the web for lenders when we can do it all for you. We have processed 11 million loans and our customers return, valuing our efficient and fast turnaround times. The Benefits Of Using Swift Money®: Simple Online application: Complete our simple application form from the comfort of your own home. Quick Processes: We use one short online application form and don’t need any extensive information or paperwork. Upon approval from one of our lenders you can have the loan amount deposited into your bank account in as little as 10 minutes. No fees: Swift Money® does not charge any fees for the processing and/or arranging of your loan, and once you are matched with a lender you will only have to pay the charges and interest that particular lender requires. High Acceptance Rates: Our large network of lenders means you are more likely to find a loan using Swift Money®. Money without the questions: Our customers use payday loans to repair their cars, pay their rent or medical expenses or help with unexpected bills. Swift Money won’t ask you to prove what your loan is for like some banks. We have helped more than 250,000 people in the UK get through their emergency cash needs. Apply Now with Swift Money® today and let us help you too. * Same day deposits are not guaranteed.